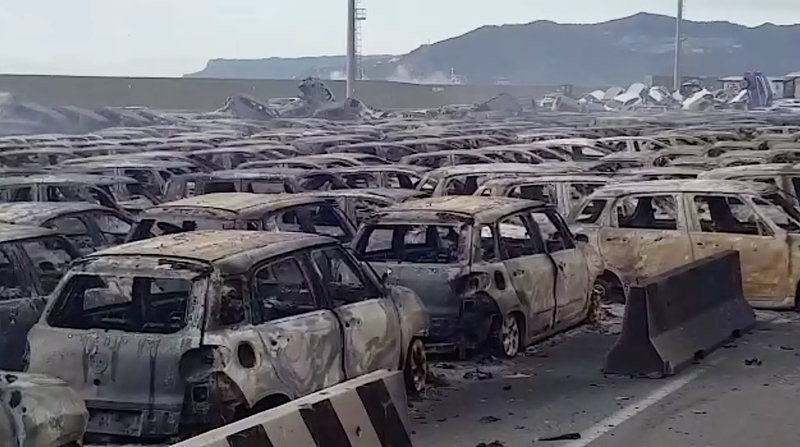 Hundreds of new Maserati vehicles which were at Port Savona in Liguria, Italy awaiting shipment to the Middle East region were destroyed in a fire that broke out in the port city. An Italian news site called The Local reported that the vehicles were at the terminal awaiting delivery when a flood occurred and sea waters started rising. They kept on rising and reached such a level that the salt water came into contact with the batteries in the cars. The outcome was a number of explosions which set off a blazing fire. Firefighters worked hard to put off the blaze. The port area was completely covered in smoke and minor explosions continued as firefighters battled the blaze. On October 23, another fire had broken out that had completely destroyed the port terminal and the Port Authority building was gutted. The Maserati cars were not the only vehicles which were destroyed in the fire. Transport trucks and other vehicles at the terminal were also engulfed in the flames. Maserati cars and SUVs are manufactured in Turin, Italy, and then they are dispatched to different cities in the world for delivery to the company’s customers. The entire region is under a red alert because of a massive storm that has gripped the area. Although there were no reports of injuries in this particular fire, the storm has affected most of Italy and caused the death of nine people.